Julian Assange, wanted by the United States for one of the world’s biggest ever security leaks, looked unfazed as he sat in a London court on Thursday, leafing through a book as he waited for proceedings to begin. Assange studied the pages of “History of The National Security State” by US writer Gore Vidal, angling the book so that reporters in the courtroom and a packed public gallery could see it clearly. When he entered the courtroom, the Australian-born activist – wearing a black jacket and black shirt, a hero to some for exposing state secrets, and a villain to others who say he endangers security – gave a thumbs-up to his supporters. In the intervening 40 minutes, he heard the confirmation of US charges against him and was found guilty of failing to surrender to a British court in 2012 over Swedish charges of sexual assault. The judge also gave the US government a deadline of June 12 to outline its case against Assange. Read | Who is Julian Assange? 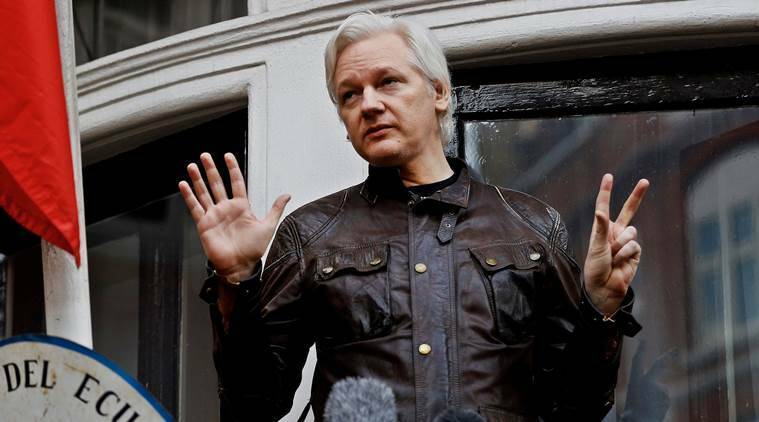 “The officers tried to introduce themselves to him… but he barged past the officers attempting to return to his private room,” the lawyer said, adding that Assange had shouted “This is unlawful, I’m not leaving,” before he was handcuffed and carried out of the embassy by police officers.